Acute Fatty liver of pregnancy (AFLP) is a pregnancy complication that some women develop either during weeks 28-40 week of pregnancy, and particularly during 35th to 36th week. AFLP also can occur after a woman birth. The condition is thought to result from trouble in the breakdown and rearrangement of chemicals called fatty acids that enter the mother from the fetus. These fatty acids go the mother’s liver, which puts them together with other chemicals to form fat molecules, and the fat builds up. 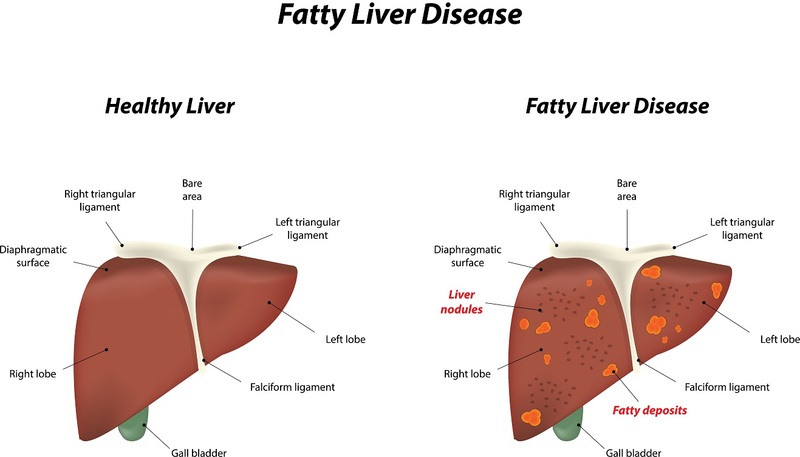 While a healthy liver consists of about five percent fat, in AFLP the fat content of the liver rises to comprise from 13- 19 percent. This causes the mother to experience numerous symptoms, such as abdominal pain, nausea, vomiting, headache, fatigue, lack of appetite, and confusion, plus the skin may appear yellow (a sign that doctors call jaundice). AFLP also can cause low blood sugar, which can lead to coma and death. Additionally, the woman can experience bleeding throughout the body and arrhythmias, irregular heartbeats. Another problem that can develop in women with AFLP is diabetes insipidus, a condition in which blood becomes too diluted, causing the person to produce very large amounts of urine. AFLP also can lead to metabolic acidosis, a condition in body is too acidic. Another way of saying this is that the pH in your blood becomes too low. Normally your pH is 7.4 and metabolic acidosis is a condition in which the pH drops below 7.4, due to changes in body chemistry that can arise in any of several different organs, including the liver. Metabolic acidosis, in turn, can produce more problems in the liver and also problems in the pancreas, brain, liver, and kidneys, leading to kidney failure, or liver failure and the need for an organ transplant. Metabolic acidosis in the mother also puts the life of the fetus at risk, so the fetus must be delivered as soon as possible. How common is this condition? AFLP develops in only 1 out of every 7,000 to 16,000 pregnancies. However, about 3 percent of pregnancies develop some kind of liver problem, so it is very important for doctors to distinguish AFLP from other pregnancy-related liver conditions. Such conditions include an extreme type of nausea and vomiting condition called hyperemesis gravidarum and certain other pregnancy complications. Once such complication is called preeclampsia, in which the woman experiences high blood pressure plus signs of damage to an organ, such as the kidney. This can lead to an extremely serious complication called eclampsia in which seizures develop on top of the preeclampsia symptoms. Another pregnancy condition that can look like AFLP is called intrahepatic cholestasis of pregnancy (ICP), which is characterized by an abnormally high flow of a liver fluid called. This happens because levels of the pregnancy hormone, estrogen, are increased. One other condition that must be distinguished from AFLP is a life=threatening complication called HELPP syndrome, which stands for Hemolysis (breakdown of red blood cells), Elevated Liver enzymes (concentrations in the blood of enzymes from the liver are too high), and Low Platelet count (the number of blood clotting cells –platelets– in the blood is too low). AFLP needs to be diagnosed early, but this can be challenging, since the symptoms of AFLP overlap with those of hyperemesis gravidarum, preeclampsia, and the other liver conditions of pregnancy. Additionally, AFLP can even look like hepatitis, a condition that is not associated particularly with pregnancy, but which can occur as it is fairly common throughout the population. Hepatitis is caused by a few different viruses, the most common and least harmful of which is called hepatitis A virus. Less commonly, viruses such as Epstein-Barr virus (EBV), cytomegalovirus (CMV), and herpes simplex virus (HSV) also can cause liver problems. Doctors also need to make sure that your liver problem is not the result of some medication as there are several drug that can harm the liver, including a very popular pain medication called acetaminophen (the ingredient in Tylenol), non-steroidal anti-inflammatory drugs (NSAIDs), anti-seizure medications, and certain antibiotics. It’s not only approved drugs that can harm the liver, but also herbal products, such as skullcap, pennyroyal, kava, ephedra. In a very real sense, herbal products comprise a greater danger than prescription medications, because people often take herbal products without informing their physicians. During pregnancy, you should never take any herbal product without discussing the product with a doctor –a real doctor, not a “naturopath”, a chiropractor, or a sales person at a so-called health food store. One big clue that you have AFLP, however, is that it usually develops during late pregnancy, or even after delivery. If doctors think that you may have AFLP, they will get images of your liver using ultrasound examination, or computed tomography (CT), which can show excess fat in the liver. Together with some blood tests, the imaging can help doctors rule out other conditions, like preeclampsia and hepatitis. By ruling out other conditions, doctors can be fairly sure that AFLP is the problem, although it is not a problem should it turn out that AFLP and preeclampsia both look possible, since the treatment is the same for both: the baby must be delivered as soon as possible. In the meantime, your doctors may need to give you various medications. As noted earlier, the treatment for AFLP is to deliver the baby. Usually this is done by cesarean section. Often before this can be done, the mother requires monitoring and treatment in the intensive care unit (ICU) to correct problems with blood pressure, blood sugar or other blood chemicals, or problems with bleeding.